Real Madrid duo Iker Casillas and Sergio Ramos have denied that team-mates threatened to demand transfers if Jose Mourinho was not removed as coach. Spanish newspaper Marca claimed goalkeeper Casillas and defender Ramos issued the ultimatum during a meeting with president Florentino Perez. "We want to show our support for the character of our coach Jose Mourinho," said Casillas and Ramos in a statement. Perez branded the report an "attempt to destabilise the club". Mourinho courted controversy recently by dropping club captain Casillas for successive league games while the Portuguese is reported to have had a heated argument with vice-captain Ramos. "The two captains of Real Madrid want to communicate the following: That the meeting held on Tuesday with the president and CEO of the club never raised any ultimatum from us regarding the character of our coach," added the statement by Casillas and Ramos posted on Real Madrid's website. "As captains of the staff and members of an excellent group of people and professionals, we categorically reject the use of our names and the rest of our squad's in support of information that is entirely false. "We want to show our support for the character of our coach, Jose Mourinho, to whom we owe the greatest respect. "Finally, we wish to convey to the members and fans of Real Madrid our unalterable conviction that only through the unity of everyone at Real Madrid will we overcome all the challenges that we face each season." Perez called a news conference to say: "It's totally false. "I don't normally come out to deny reports, but this was too important." 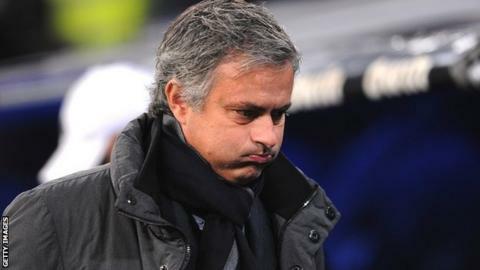 After comfortably last season, Mourinho has come under scrutiny this term following an indifferent run of results which has left the club trailing leaders Barcelona by 15 points. There have been several reports of in-fighting between the coach, his playing staff and some club directors. But Perez added: "I understand some people want the coach or president out, but what has been published is a lie. "We [the board] are the only ones that will decide the future of our club." There have been high points this season, with Real into the and the semi-finals of the Copa del Rey after completing a 3-1 aggregate victory over Valencia on Wednesday. Speaking before the Valencia game, Mourinho conceded the Spanish league title was beyond Real. "The league title is impossible now - there is too big a gap," he said in an interview with RMC Sport. Mourinho in May but has continually been linked with a move away from the club, with a return to Chelsea or a move to Paris St Germain touted. Meanwhile, Casillas faces a long spell on the sidelines after fracturing a bone in his hand during Wednesday night's cup clash with Valencia.